Batteries are located in the column, not on the base like Birds. Here they are. Same manufacturer as the current Limes we have. Rougher ride with the solid tires like lime? Pretty much the same in every way. In a way it felt a little better, but that may be from them having the battery in a different location and other things. Here is an article about the new Bird scooters. Sounds like they aren't rolling those out in KC (or anywhere yet), but maybe some have made their way? Seems it would be better to define a service area and then distribute evenly across area - ideally anyone in service area can access within a couple blocks. Some automated data analysis of daily usage per market should give them a solid idea how to keep fairly evenly distributed. If delivering outside service area, it may create a sprawling gap of scooters. Would target density within a service area first, then expand service areas with more scooters as available. But if people are willing to pay for delivery, would be an interesting test. They are mostly on the West coast and are being rolled out elsewhere now. Also to note: Lime is at full operating capacity with the city agreement (500 scooters). Shields is trying to get the scooter tax revenue put into the new affordable housing fund. It wouldn't go far towards affordale housing, but it does keep the money from being used for mobility lanes. What a cynical move by Shields. Allows her to pay lip service to affordability while retaliating against mobility lanes. Can we please vote out this mediocrity? She only won because Glover was worse, he didn't even give lip service, would turn his back on you. If this keeps up, expect the state to pass a pre-emptive ban on local dockless regulations. I was able to visit the KC Lime Hub and was overall very surprised at how the operation is ran. The below images show the amount of Limes they capture in a regular night vs. us Juicers (and shows how easy it is to steal one down there...) and how many damaged ones we have already. The one I dropped off had a broken handle, bent wheel and missing battery- all with a little blood on the stem. Great! 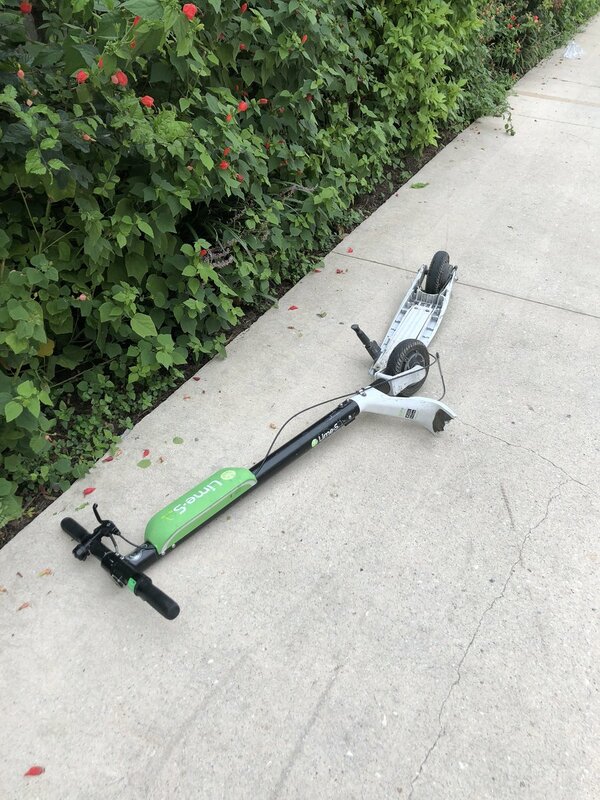 Both Lime and Bird are now authorized up to 500 scooters each. ^Thought 500 was limit set about a month ago. Amusing it shows a pic of illegal usage - riding on sidewalk by city employee? This is similar to Uber's approach of renting shared electric bikes (branded Jump) in their app (and Lyft will likely show the Motivate bike share systems they acquired earlier this year). Lime scooters should be available in the Uber app sometime soon. Scoot -- previously known for electric shared "sit down" scooters -- has also launched "kick" scooters. The original scooter brand Razor has also launched a shared electric scooter service. Have there been any complaints to City ever since Bird/Lime expanded? If not, any chance City will allow more scooters (over 500 per operator) or more operators?